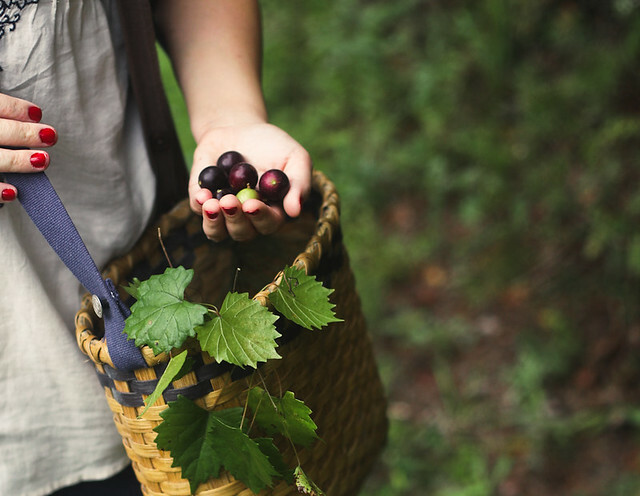 There was a fine drizzle of rain as we walked down the dirt road that runs in front of our house, looking for the muscadines that grow wild this time of year. 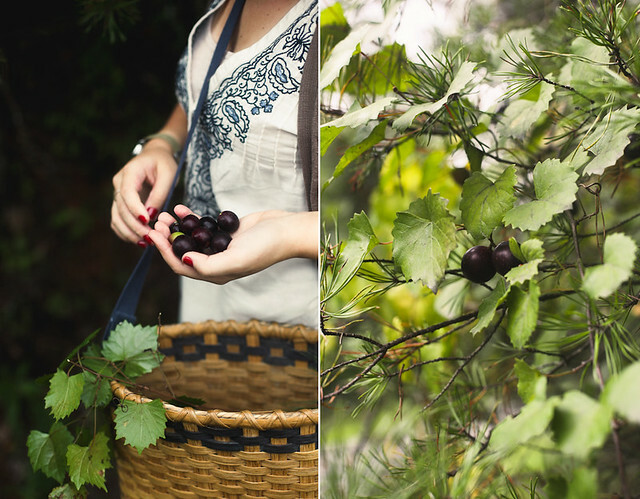 The vines were tangled high in the evergreen trees, we stood up on our tiptoes to grab handfuls, tumbling them into our basket. Their colors vary from nearly black to the prettiest shade of purple I've ever seen. Muscadines are so fragrant, deep and rich, vaguely winey. I brought them inside, cut them open, and set them to simmer down into a syrup, the scent filling the house, lingering in every corner. 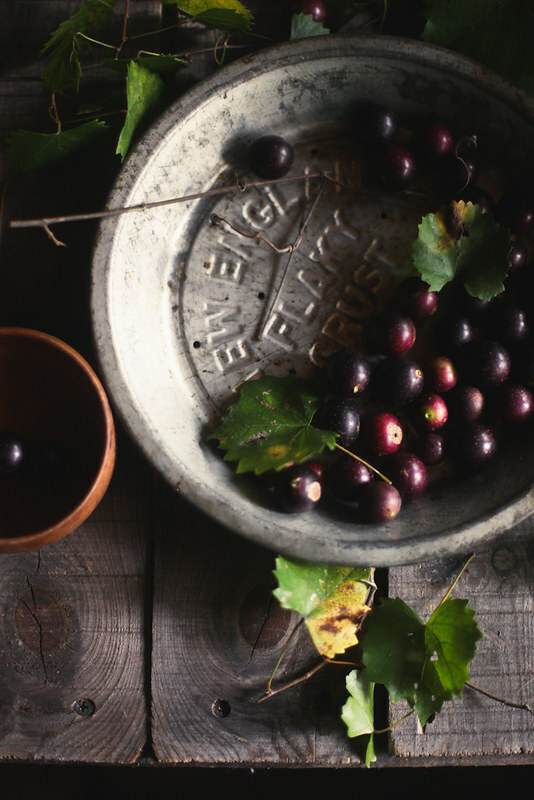 My mom has been telling me about her grandmothers muscadine jelly since I was a little girl. 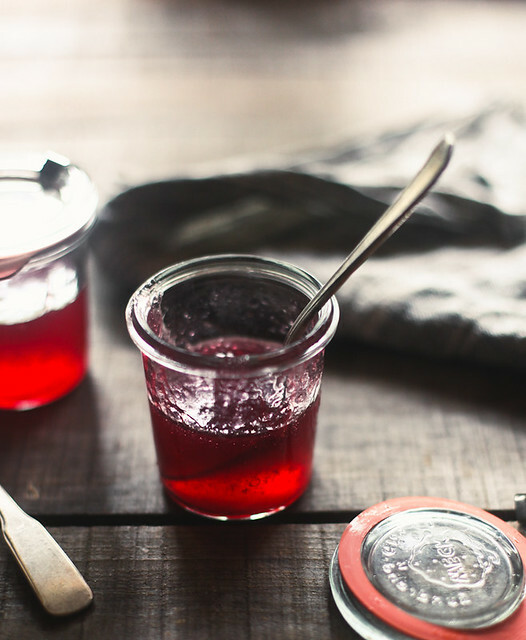 She waxes poetic about the sweet stuff, but I never had the chance to meet my great-grandmother, or taste her jelly. As I was standing over the bubbling pot, I felt connected to this woman I never met. It's funny (and wonderful) how food can do that. I didn't have quite enough juice to make jelly, so I decided on a syrup, ruby red & sweet. It'd be great over biscuits or pancakes, even ice cream. I stirred a spoonful into a cup of hot black tea. Next time I'm going to turn it into muscadine sorbet. To release the juice, cut open your muscadines and place in a stock pot. Fill pot with water, just covering the muscadines. Simmer for 15 minutes, mashing occasionally with a potato masher. Pour fruit through a mesh strainer, pressing hard on the solids, (I then placed the skins in a lemon juicer, to extract as much juice as possible), into another stock pot. Add sugar and lemon juice, and bring the juice to a boil, then allow to simmer. Cook until it coats the back of a spoon. Pour into clean jar. Can be kept in the fridge for up to 2 weeks. *You want equal parts juice & sugar. If you have more/less juice, just add the same amount of sugar. I started with about 4 cups of muscadines and got 1 cup of juice. Well, I have to thank you for this lovely intro to muscadines. I had not heard of them until you posted about it on Facebook. Now I feel a strong desire to try them. That color... stunning. beautiful! I don't think I've ever tasted muscadines before but a sorbet sounds incredible. gorgeous gorgeous gorgeous! you are just blowing me away, Hannah. It's amazing the variety of fruit to be found in the wild. Never heard of these but I live the simplicity of your recipe Hannah. Over pancakes sounds good to me. Hannah- this could be one of my favorite posts of yours. Love this and am dreaming of this on a piece of toasted and buttered brioche. Hi, I just recently discovered your blog and I am in awe. All of your photography and styling are simply beautiful. I love this post. I too have never heard of muscadines, but the color is amazing and I want to try this syrup! i've heard of muscadine but never seen them - what jewels! love their color and that gem-like color of the syurp. such beauty. Beautiful! Now I'm curious if my neighbor's tree [that overhangs into my yard] actually has muscadines instead of grapes. I haven't ever paid too much attention! Your blog is so beautiful, truly an inspiration. I love this post about finding unusual, local delicacies and creating heaven from them. I recently discovered we have Elderflower growing on our land and am looking forward to learning to make syrup from the flowers next year when they come back into bloom. Elderflower goes beautifully with gooseberries for jam. Thank you. My husband picked some about a month ago and I juiced them....so good! I saved a few seeds to plant some at our house---though from experience in the wild, they do get out of hand here in Texas. A great native! I don't think I ever had muscadine but by the look and your description, I think it's a great treat. Plus I love the color so very much! 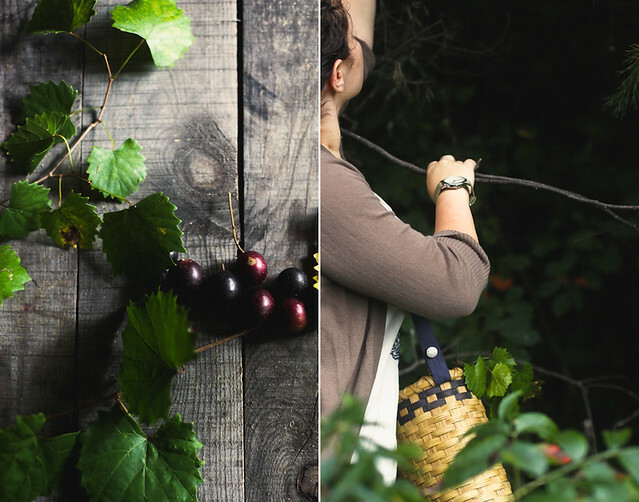 What are muscadines? I realise from your blog post that they are a fruit and grow on a tree but are they a berry, or like a plum? I hope that you don't mind me asking but I've no idea. Hannah, I grew up in Kentucky but have never heard of Muscadines. Now I'm intrigued. The next time I'm home during their season I'll have to look for them. Beautiful photos as always! Hannah, everything you do is beautiful. I love this gorgeous post. I love the feel of this post! The transition from summer to fall is my favorite. Also, that basket is fantastic! Love your blog, love this post. 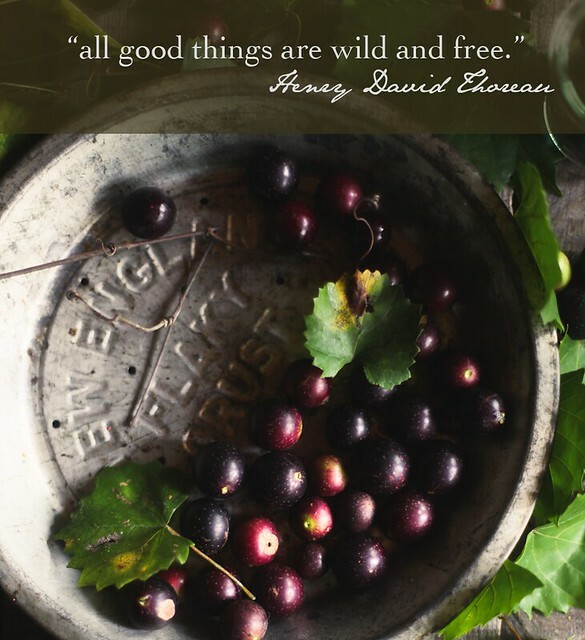 I'd never heard of muscadines before - do you get them in the uk? I, also have never heard of these grapes. They sound (and look) delicious! I love your photos! I have never heard of those grapes either but the jam looks super yummy! You're a great photographer! 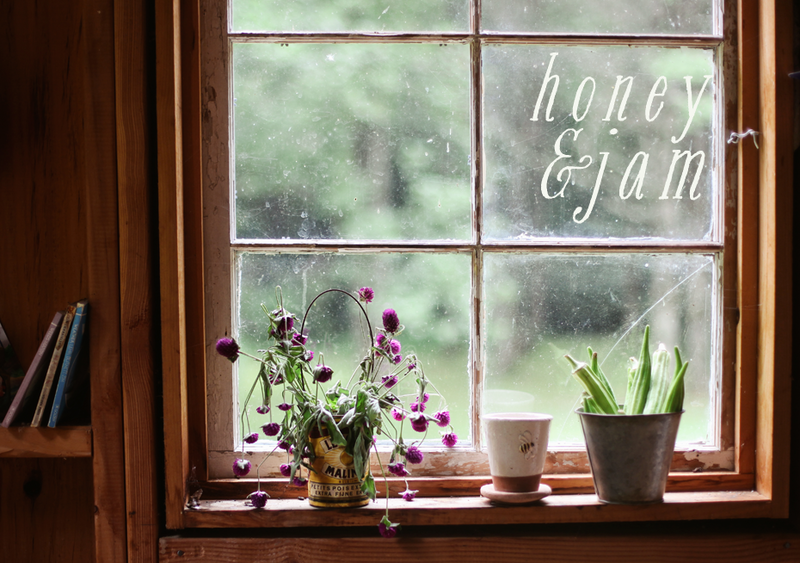 Hello, I've just discovered your beautiful photography and of course, your gorgeous blog!!! The photo of the Muscadine syrup is just stunning! Hello Hannah, just to say I love your blog. Your pictures are amazing. It's very inspirational for me. I live in France and commute every day to work in Paris and I appreciate the quietness of your environnment. I've never heard of these grapes before and they look gorgeous! I love your posts and I always feel like you're living some magical life in the woods. The light, the colours and the care in everything you do is pretty special. I have honestly never heard of muscadines before but they look absolutely beautiful like little balls of gorgeousness. Brilliant! Got some muscadine hunting to do this weekend. Got my eye on your next posts. What a great post! My father has just planted muscadine grapes and host to harvest them within the next few years. Your blog is great. Beautiful pictures and very tasty food! I love it! This sounds like a very unique flavour :) Your photos are lovely and it's obvious you have a natural eye for composition and detail. I've been following on Flickr and I will for sure follow you here:I just adore your photographs, they are so warm, colorful, true and dreamy. Never had muscadine syrup in my life, sounds amazing! I love your photos, they are so crisp and beautiful. 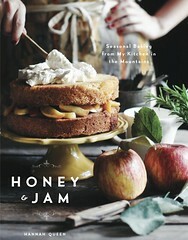 I discovered your blog via a recipe pinned on Pinterest! It is a pleasure reading it. I have also bookmarked you for checking out new posts. I used to be able to find good info from your blog posts. What I look for the post many time. I have also bookmarked you for checking out new posts. It is a pleasure reading it. I have also bookmarked you for checking out new posts. Excellent post. It is a pleasure reading it. It is a pleasure reading it. I have also bookmarked you for checking out new posts. Thank you so much. It is a brilliant blog post. What i look for the post many time. Thanks for the share and really treasure your effort. What I look for the post many time. I have also bookmarked you for checking out new posts. It is a pleasure reading your blog posts. I have also bookmarked your blog post for checking out new posts. Excellent post it is a pleasure to reading it. I have also bookmarked you for checking out new posts. Your post is very informative. Thank you so much. Excellent post it is a pleasure to reading it. I have bookmarked your post in my computer. Thank you so much. What I look for the post many time. Thanks for the share and really treasure your effort. Thank you so much. really nice post and pictures make it more buetiful...I am gonna have juice. This blog truly impressed me. I was searching some information. while searching in Google came to know about your site . The old saying a tobacco product underneath the Tobacco Act (i.e., under Subchapter IX within the FDCA) clearly includes electric cigarettes. A tobacco strategy is: "any product made or produced from tobacco that's meant for people to drink, including any component, part, or accessory in the tobacco product (aside from recycleables apart from tobacco present in manufacturing an element, part, or accessory in the tobacco product)." Because electronic cigarette have when you component nicotine that's produced from tobacco, they constitute a tobacco product under section (rr)(1) within the Tobacco Act. By sleeping on your part, this kind of defintely will not since problematic along with the moving seems regarding snoring mouthpiece won't be produced by anything rubbing inside throat once you rest. As well as aspect resting, you'll find niche pillows proclaiming to aid control loud night breathing. You may even make use of several pillows and elevating the human brain a bit greater since this keeps the actual environment pathways more evident all through sleep. If none of men and women strategies manage to function, look at a existence-style alter. Just if you happen to provide light for or perhaps acknowledge your pet, it might be time for it to consider allergy symptoms. These kinds of and plenty of further conditions can result in allergic reactions, which includes airborne dirt and airborne debris. I have found this article very exciting. Do you have any others on this topic? I am also sending it to my friend to enjoy your writing style. Thanks for sharing .. The Limited Liability Company or LLC is not a partnership or a corporation. Limited Liability Company (LLC) is a relatively new business structure allowed by state statute. An LLC is a distinct type of business that offers an alternative to partnerships and corporations, by combining the corporate advantages of limited liability with the partnership advantage of pass-through taxation. Buy mini jars of quickly pull as well as honey. Connect a compact wood made table spoon towards neck with the container, using a location credit card, intended for fast wedding ceremony Window Treatements in Surprise AZ as well as marriage shower favors. In your post the muscadines are looking very nice. And now I think to make this muscadine syrup. Thanks from clipping mask service to this nice post. I feel so inspired when I read all comment .. thankyou.. It will have just one in the bottom with all the stock market estimates, just one towards the top which demonstrates the cost of fat, gold, your stock market, as well as the attachment yields. And then it will have an occasional call information online news which results in in a distinct rate from a distinct course when compared with the many rest. Any difficulty . these kind of areas have learned exactly the same tips for retaining the attention course on the people mind hectic using other visual shows.